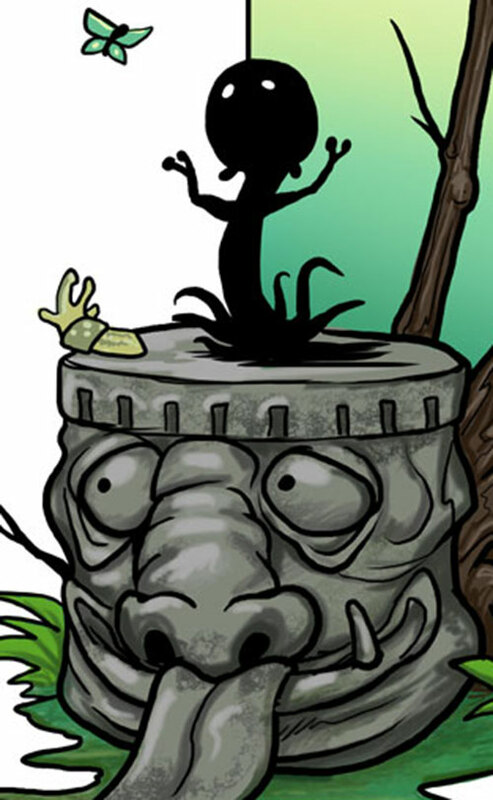 Shadowchild was one of the major characters in the award-winning fantasy webcomic Digger. As with all our Digger profiles, this one has S P O I L E Rs. 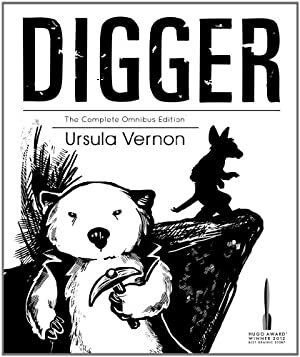 Readers unfamiliar with the story should first read our Digger the wombat character profile. Shadowchild is a living shadow, as if made of black ink with two slightly glowing white eyes. Its fluid form is flexible, gooey and cannot be hurt by ordinary weapons. However, enchanted weapons such as those used by the Veiled will hurt and even leave a scar. Shadowchild eats shadows. Shadows that provide actual nourishment are ontological ones – cast by beings experiencing some sort of natural or moral corruption. Thus evil or very sick people, trees, animals, etc. will be delightful. By contrast, there’s little to eat in a virtuous person. Having one’s shadow devoured is normally fatal. But there is an implication that it might purify the rare survivor. 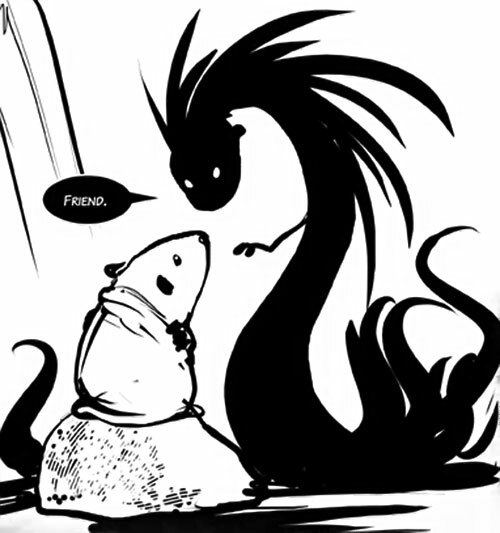 Shadowchild can grow into a large, demonic/draconic shadow that will usually send people running away in terror. 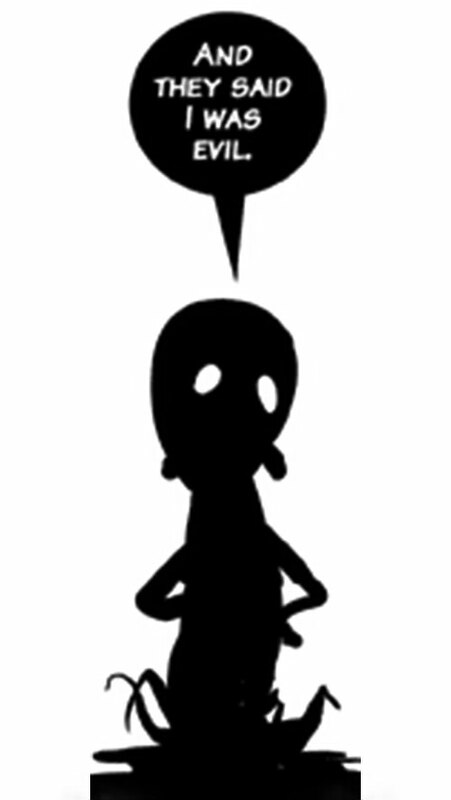 But it’s a bluff, since it stretches Shadowchild’s body so thin that it can’t actually do anything when it’s that large. Its squishy body can also easily grow tentacles that makes climbing a synch. Near the end of the story, Shadowchild grows up by one “step”. It is clearly more powerful in this form, but there’s no data about that. Shadowchild was “born” within the corpse of a bird. But he had to leave when it grew too big for the body – and the flies feeding off it became too loud. Though capable of speaking, it had no idea of its nature. It just ambled around wondering what it was, occasionally feeding off the shadow of a rotting tree or somesuch. It seemed possible that Shadowchild was a demon. But though it could kill and did so once in self-defense, it didn’t seem malign. Shadowchild once stumbled upon the wombat Digger and became her friend. It also once went to the temple of Ganesh to ask whether he was a demon. But the Veiled guards there tried to kill him as they assumed that he was. Shadowchild then more or less stuck with Digger. Though the wombat didn’t feel qualified for this, she tried to instil the basics of ethics to Shadowchild. When Digger was manipulated into going on a quest, Shadowchild followed her. This is how it met the ancient demon that hyenas called Sweetgrass Voice. Sweetgrass Voice confirmed that Shadowchild was a demon, and wanted it to kill Digger and her friends. But Shadowchild refused and forced Sweetgrass Voice back. During the fight, Shadowchild absorbed knowledge from Sweetgrass Voice and evolved into a more mature form. Finally knowing its nature, it chose to seek other feral demon children, both for company and to offer them an alternative to growing up into evil demons. Shadowchild is a blank slate. Though it possesses a full vocabulary, it has no experience of the world. It does not know what many of those words really mean. It is endlessly wondering what its nature is, and has experienced with being a tree, a bat, etc. or anything it might *very* vaguely be. At first, Shadowchild incessantly asked Digger whether it was whatever they were discussing. But it eventually realised that it was going to be more complicated than pointing at everything and asking whether it was like that thing. Later on, Shadowchild tried to talk with pretty much anything that moved, and some things that didn’t. Shadowchild likes Digger (it can plainly see that she has very little shadow in her heart), and she acts a bit like a parent to it. Especially since she suspects Shadowchild might be a demon, and preventing it from growing up evil is important. Thankfully, Shadowchild reacts very well to positive reinforcement. Though it was a bit clumsy, Digger taught Shadowchild that killing and inflicting suffering are bad things. Detect has a Range of 2 APs and requires line-of-sight. RV bonus from Fluid form is halved against enchanted weapons. Magic Blast has No Range, but acts as its own AV. The APs of Power that can be deployed are limited by how evil and harmful the person is – it could easily drop to 2 APs against a heroic person. Acrobatics and Charisma are both Contingent Upon Fluid Form.